The operation was launched after a 48-hour siege by security forces failed to drive them out of a five-storey building in Sylhet, a northwestern city. 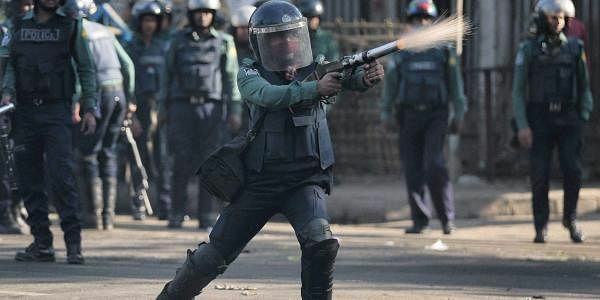 DHAKA: Bangladeshi commandos today launched a military operation to flush out militants belonging to an Islamist group behind the country's worst terror attack from a building amid fears that several residents were trapped inside. Officials and witnesses said army para-commandos led by a major general launched the crackdown assisted by police's Special Weapons And Tactics (SWAT) unit, counter terrorism unit and elite anti-crime Rapid Action Battalion (RAB). "GOC (general officer commanding) of our Sylhet-based 17 Infantry Division Major General Anwarul Momen is leading the 'Operation Twilight' there," a military spokesman told PTI. TV channels were barred from live coverage of the operation. Earlier reports had said at least two suspected militants, including a woman, were inside the building, but a police officer later feared a "whole lot of them" could be there. Police said militants are believed to be the operatives of neo-Jamaatun Mujahideen Bangladesh (neo-JMB). The neo-JMB, said to be inclined to the Islamic State, was behind the July 1 terror attack on a Dhaka cafe in which 22 people, including 17 foreigners, were killed. Officials said at least 28 families were trapped inside the building. Some 70 people could be evacuated ahead of the full scale military assault. The police used megaphones to ask militants to surrender before launching the operation. Military put barricades on adjacent thoroughfares including on a regional highway as joint forces took position to storm the militant hideout. Authorities overnight cut off the gas and power lines to the building. Police asked the people in the neighbourhood to stay indoors. Operation Twilight was launched after a suicide bomber blew himself up near the international airport in Dhaka in an attack claimed by Islamic State terrorist group. Bangladesh witnessed a spate of attacks on secular activists, foreigners and religious minorities since 2013. The country launched a massive crackdown on militants specially after the Dhaka cafe attack.